...every time you walk past the stuff that's always got to be moved to somewhere else. What's on your stairs? Right now? For us it's £1.75 in silvers, Scotch satin finish giftwrap tape, jogging pants, and a table tennis bat. Everyone has stuff on their stairs - to go upstairs. Even if they do not have actual stairs. 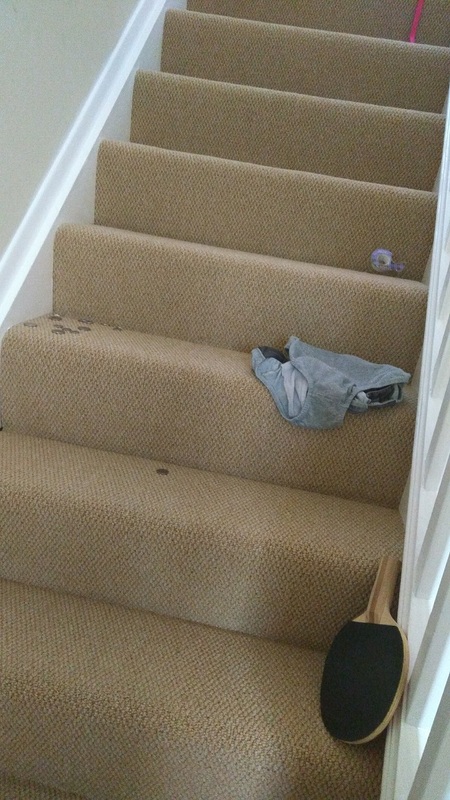 Deep down, we all have stuff on our stairs. And we even walk past it - knowing that there will always be a better time to take the stuff up. It is a job that will never be done. So I ask you, in all seriousness. What's on your stairs. May we see a photo please? It's a snapshot of your upward flow of life.